Weight gain happens from time to time, but for runners, it can be troublesome especially when your weight can be difficult for your knees and feet. Of course, you will be wondering if you can really run even when you’ve gained weight. The answer to this is yes, unless your doctor has recommended otherwise. 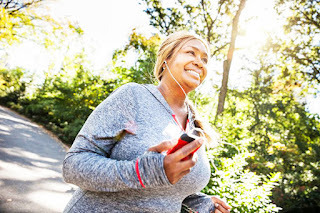 If this is your first time to have gained weight, or you are not really into physical activities, there are a few things that you can do to lose weight so that you will be able to run safely. Here are a few tips that you should know of. If this is your first time to start running, and you are carrying a lot of weight on your body, make sure that you start slow. There are several programs online that you can use to train your body to this new activity starting with a run/walk style. Always start slow when you are working out so you won’t hurt yourself. You can always start with walking around the block for a few minutes. In order for you to know what your ideal weight is, you will need to determine how many calories you will need. This depends mostly on your height and weight. Once you have determined your caloric needs, you should then gradually cut back on your consumption as you burn the rest through exercise. Make sure that you lose weight slowly as it is much safer for your body this way. Keep in mind that the extra weight that you are carrying on your body can add pressure to your bones and joints so make sure that you are putting days of rest in your routine. As much as you would like to run every day, you will need to give your body time to rest. Use a foam roller afterwards to help stretch your tired muscles after a run and don’t forget to do a pre-workout warm up and post-workout cool down to minimize muscle aches and pain. Losing weight as a runner won’t be fast depending on how much weight you need to lose. With that being said, these steps are good places for you to start so you will be able to keep your weight down to enjoy your runs even more.